← What Do We Want in Art? Conceptualists? Experimentalists? Plagiarists? I had promised myself I wouldn’t buy any more books until I’d gotten through those on the 2014 reading list (and the updated 2014 reading list) and the soon to be further updated 2014 reading list read. This was my solemn vow, my stern dedication, my forthright resolution. I have already fallen short of the glory. Vow, dedication, resolution – in pace requiscat, as Mr. Poe once said…. Lea and I had to be in the city (well, our nearest city) for some appointments, both medical and professional a couple of days ago. We had to be there early, and since it’s a two hour drive, that means we had to leave our home in the lovely NC mountains very early. My usual habit is to take along a book or two so that while waiting for appointments I can read and further feed my addiction to beauty and truth. You can guess what happened: leaving at that early hour, I had travel mug of coffee in hand but the other hand, alas, held no book. To remedy that situation, after our first appointment we stopped by our favorite used book store. And I bought another book. It’s a book I’ve been wanting to read for a while now since finally reading this writer’s work for the first time last year (I actually have more of his stuff on the shelf, but I was holding off for – I don’t know, the 2015 reading list?). 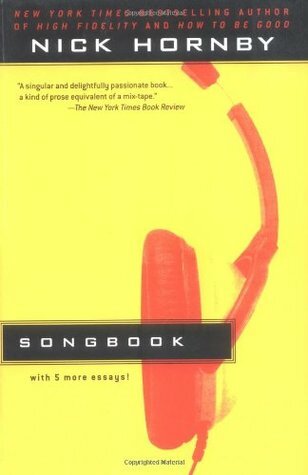 Nick Hornby’s Songbook is a compilation of essays on a really wide variety of pop songs (and something I love about this book is that Hornby casts the widest possible net in his use of the term “pop”; it’s a net that captures artists ranging from Led Zeppelin to Nelly Furtado, from Suicide to Richard and Linda Thompson, from Röyskopp to Patti Smith. The man has eclectic tastes. There are two important points I’d make about this book. The first is that Hornby’s generous view of music leads him to defend – well, sometimes, the indefensible. His defenses are always thoughtful and sometimes clever – for example, he makes no bones about the fact that the album from which the Nelly Furtado song he writes about, “I’m Like a Bird,” is otherwise uninspired – and uninspiring. His argument that the album is worth it for the one track feels a little strained, especially when he offers the argument that “I’m Like a Bird” will become no more tiresome than, say, “The Moonlight Sonata.” I get the point he’s trying to make, that pop music is an art form and that any art form may become tired – but maybe the above comparison tends too much toward metaphor, for me at least, given that the only thing I can find comparable between those two works is that both are music. I understand the “ear worm” phenomenon perfectly well, but there are (or should be) limits…. ‘All these years later and Suicide still feels like a shot in the head,’ an enthusiastic reviewer remarked when their first album was re-released…however, I have come to the conclusion that I don’t want to be shot in the head, and so I will avoid any work of art that seeks to re-create that particular experience for me…some of us, as we get older, simply find that we don’t have that much courage to spare anymore. Good luck to you if you have, because it means that you have managed to avoid more or less everything that life has to throw at you, but don’t try to make me feel morally or intellectually inferior. That last clause sums up my feelings about the people who belittle my dislike of Pink Floyd pretty well. Hornby waxes eloquent about Aimee Mann‘s work (who was having quite a vogue about the time he wrote Songbook). One point he makes about her songwriting, a point that applies to all songwriting, bears mention: “…music is such a pure form of self-expression, and lyrics, because they consist of words, are so impure, and songwriters, even great ones…find that, even though they can produce both, words will always let you down.” (italics mine) That’s a potent statement – and especially so since it comes right after Hornby’s confession that if he could write songs he’d never have written books. I mention this point because it illuminates how Nick Hornby listens to music – he’s a “music first” listener. A song’s instrumentation – or its beat – or some other aspect of its musicality – will engage him before – and likely more than – its lyrical content. That might seem strange since he’s to all appearances a “word guy” – but it’s not, really. Many, probably most people are drawn to the music rather than the words. That also explains a lot about the wonderful – and terrible – tastes people display in musical choices when one thinks about it. Pop snobs always think that the bands that they love have been treated unfairly, that their failure is evidence of a tasteless, ignorant, and tone-deaf world, but the truth is that invariably these bands are too quiet, too anonymous, too ugly, too smart, and they’ve spent too much time listening to Chris Bell or The Replacements or Bill Evans instead of dressing up, taking drugs, trying out makeup, and picking up fourteen-year-olds; I may prize the songwriting craft of Paddy McAloon over the vulgarity of Eminem, but it would be stupid to pretend that I don’t know why Eminem is the bigger star. In this same essay Hornby also covers being friends with musicians (it’s how he became a fan of The Bible) and the bias about their music that results, for good or ill, in bad reviews for good artists and good reviews for bad. It is a real problem – and it’s good to see Hornby so honest about it. Would that all music critics (Hornby served for a time as popular music critic (rock) at The New Yorker) were so inclined towards openness about their process. There are a couple of other points that Hornby covers in this collection that deserve note. One is in the essay on the chill-out musical ensemble Röyskopp. He became enamoured of one of their tunes, “Röyskopp’s Night Out,” only to have it ruined for him because the band had managed to get it onto numerous compilations and so he heard the song at stores, hotels – everywhere, it seemed. As he notes, “It had become a cliché…and I couldn’t bring myself to play it again.” The ubiquity of pop music, Hornby argues, has been its enemy; when one hears it everywhere, it loses its impact and becomes just like the Muzak that was once derived from it: background noise. Then there are his comments on those who simply use their computers to sample other artists and create mash-ups and the like: “this way allows those of us who have no talent but love our music to create something great…finally, the true genius that is fandom has been recognized.” One wants to believe Hornby’s tongue is firmly in his cheek, but that’s not entirely clear. He is, after all, a fan himself. There is an argument that says that pop music, like the novel, has found its ideal form., and in the case of pop music it’s the three or four minute verse/chorus/verse song. And, if this is the case, then we must learn the critical language that lets us sort out the good from the bad, the banal from the clever, the fresh from the stale…the next Lennon and McCartney are probably already with us; it’s just that they won’t turn out to be bigger than Jesus. They’ll merely be turning out songs as good as “Norwegian Wood” and “Hey Jude,” and I can live with that. So say we all, Nick. So say we all….